Maryland has seen a recent increase in homeless youth who are not in the physical custody of a parent or guardian and who are between the ages of 14 and 25, a population known as unaccompanied homeless youth. 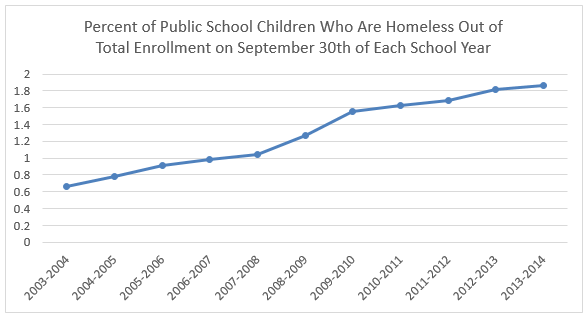 Data from the Maryland State Department of Education shows that this population has increased by more than three-quarters (80%) since School Years 2007-2008. This vulnerable population is more likely to become disconnected and socially disengaged, at risk of physical and sexual abuse, and reports higher rates of mental, behavioral, and physical health issues than their peers. The lack of data around the number of youth experiencing homelessness in Maryland makes it difficult to plan for and deliver services. A better understanding of the scope of the problem is necessary to develop solutions, effectively focus limited State resources, draw down federal funding, and measure the effectiveness of the interventions over time. In developing potential housing solutions, the need for a robust and flexible continuum of emergency, transitional, and permanent supportive housing options must be at the core of any successful plan. Without stable housing, unaccompanied homeless youth are at an increased risk of resorting to delinquency or other high risk behaviors. One of the many barriers to acquiring housing, employment, and public assistance that unaccompanied homeless youth have to overcome is a lack of identification documents. Ensuring that unaccompanied homeless youth have proper identification documents is a crucial first step to getting them back on the path to success. Ultimately, effective programs are proactive about understanding the population they serve, its needs, and how to effectively craft outreach efforts. Outreach is especially crucial with the unaccompanied homeless youth population as many of these youth are hesitant and unsure about reaching out for assistance. For information on State programs and specific departmental approaches in the effort to reduce youth homelessness, please refer to the Children’s Cabinet Strategic Direction and Implementation Plan.